Mimi is on a streak. Caution is one of the best-reviewed albums of her career. And just a couple of days ago, “All I Want For Christmas Is You” went to #3 on the Billboard Hot 100, the “first holiday song to break the top 5 in 60 years”. Also for New Year’s Eve she performed at Nikki Beach in St Barts which means she was PAID to perform in St Barts. And then…did you see this Twitter thread that went viral yesterday? So, there’s a lot to celebrate in Mimi’s world. 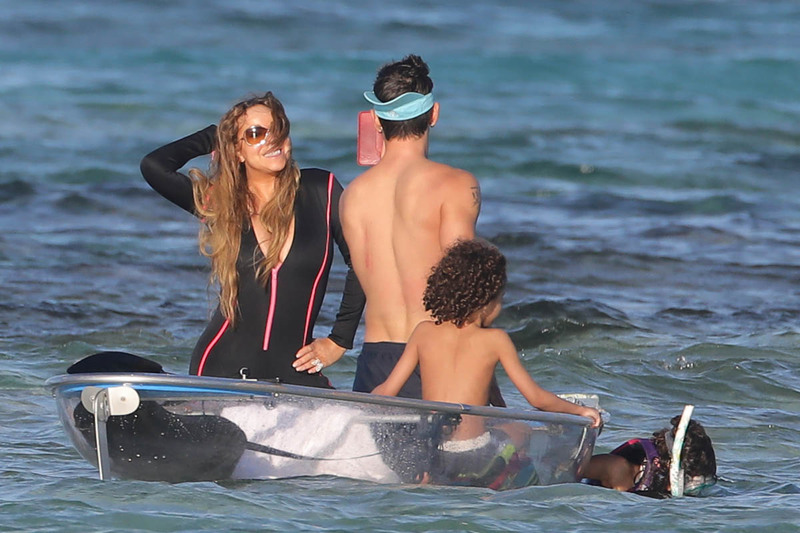 And she is, of course, celebrating in St Barts, on the beach, with her kids, dembabies, Monroe and Moroccan, and her boyfriend Bryan Tanaka who’s been in the position for …is it two years now? And it’s been a steady and stable last year or so. Like, for the most part, Bryan’s been a quiet presence. He’s there but he’s not shoving his face into the camera constantly either. I’m pleasantly surprised by this. It’s a good surprise. And she’s the most sensitive to that too so, I mean, if we’re noticing that, she must be appreciating it. Well. As much as she appreciates anyone other than herself. But why should she spend time appreciating anyone else anyway? Let’s appreciate Mimi appreciating herself in her wetsuit, frolicking in the water, posing for Bryan who’s taking pictures – and not the other way around. Again, as it should be.